- Break the "I'll start again on Monday cycle" and feel good about yourself today. - Stop agonizing over the numbers on the scale and make peace with your body. - Replace rationalizations that lead to failure with wisdom that leads to victory. - Reach your healthy goals and grow closer to God through the process. 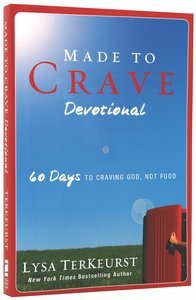 Use this Made to Crave devotional to begin a 60-day journey that will transform your cravings for food into a fulfilling desire for God. Start your day with breakfast for the soul! About "Made to Crave Devotional"
Lysa Terkeurst is the president of Proverbs 31 Woman Ministries and author of 12 books, including a Gold Medallion finalist and People's Choice Award finalist, and numerous magazine articles, including feature stories for her ministry's magazine P31 Woman. Her life story has captured much attention of national media, including The Oprah Winfrey Show and Good Morning America. She lives in North Carolina with her husband and five children.